The robot is programmed to process questions and select words from its vocabulary to construct an answer. Kirobo and Japanese astronaut Koichi Wakata. THE FIRST HUMANOID robot in space made small talk with a Japanese astronaut and said it had no problem with zero gravity on the International Space Station. 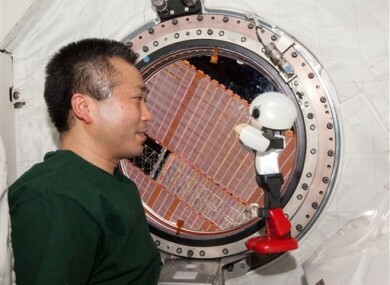 Footage released by the robot’s developers today showed Kirobo performing its first mission on the station, talking in Japanese with astronaut Koichi Wakata to test its autonomous conversation functions. Wakata says he’s glad to meet Kirobo, and asks the robotic companion how it feels about being in a zero-gravity environment. “I’m used to it now, no problem at all,” Kirobo quips. Kirobo is programmed to process questions and select words from its vocabulary to construct an answer, instead of giving pre-programmed responses to specific questions. The creator of the robot, Tomotaka Takahashi, said the autonomous functions meant nobody knew how well Kirobo would be able to answer Wakata’s questions. Though Kirobo had some awkward pauses and Wakata spoke more slowly than usual at times in their chat earlier this month, Takahashi said conversations smoothed out over time. “Through layers of communication, we were able to observe the initial stages of a relationship begin to develop between a human and a robot, and I think that was our biggest success,” he said. Kirobo took off from Japan’s Tanegashima Space Center for the International Space Station this summer aboard a space cargo transporter. Wakata arrived in November and will assume command of the station in March. The project is a joint endeavor between advertising company Dentsu, automaker Toyota, and Takahashi at the University of Tokyo’s Research Center for Advanced Science and Technology. Experiments with Kirobo will continue until it returns to Earth at the end of 2014. In the meantime, Kirobo says he wants to ask Santa for a toy rocket this Christmas. Email “Japanese robot chats with astronaut on space station ”. Feedback on “Japanese robot chats with astronaut on space station ”.